Weighted blankets are popular, but most use poly pellets. Learn how to make a weighted blanket without pellets. How to sew a weighted blanket sewing tutorial. My weighted blanket sewing tutorial is one of my most popular posts on this site. After years of helping readers with their projects – I get emails every day with questions even years after that initial post – I decided to dedicate a series of blog posts to commonly asked questions about making weighted blankets. Today’s post features one of my most commonly asked questions: How to make a weighted blanket without pellets. 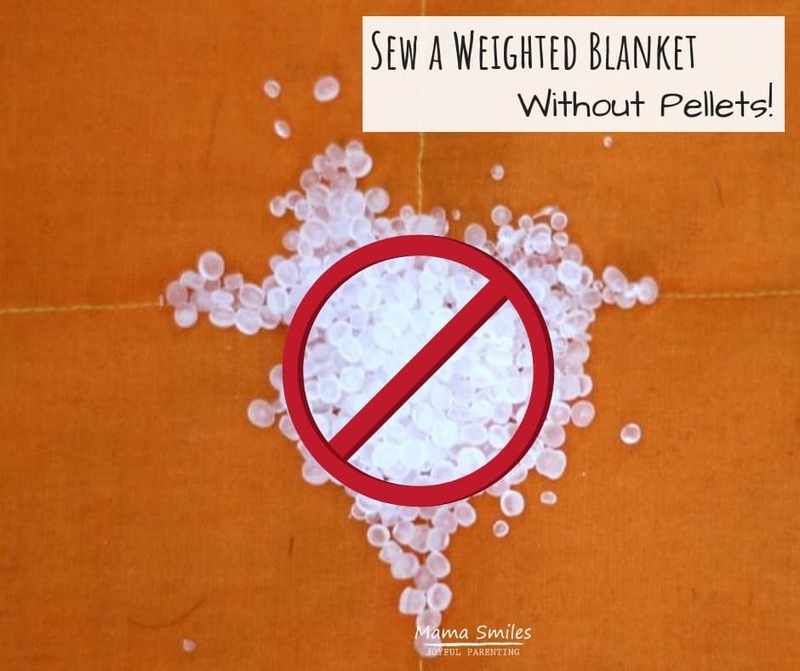 Most weighted blankets are made using poly pellets. Poly pellets are a popular filling because they are non toxic and can go in the washer and dryer. They discourage mold growth and are lightweight individually, and therefore unlikely to cause harm. What Are Weighted Blankets Made Out Of? However, there are a number of reasons to avoid using poly pellets. Some people worry about the fact that poly pellets are man made. Others are looking for a more inexpensive filling. 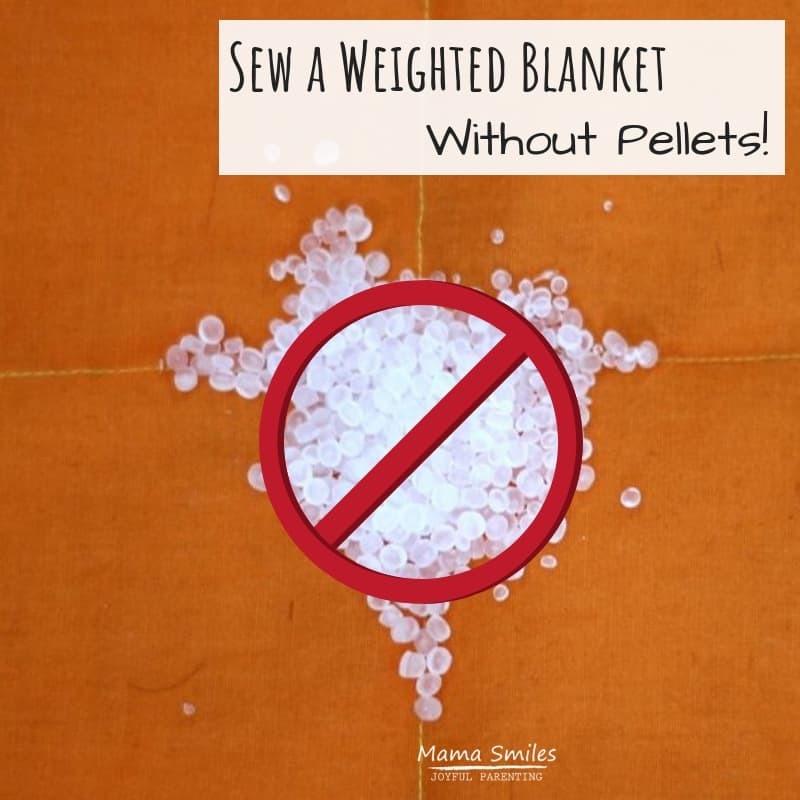 Luckily there are several pellet free ways to make a weighted blanket. Here are some of the most popular options. Growing up, our picnic blanket was made out of old pairs of denim blue jeans. We used it as a picnic blanket because it was so sturdy and useful for protecting us from damp grass, but the blanket doubled as an amazing weighted blanket! Denim is naturally heavy, and when you pair it with quilt batting and a second layer of fabric it grows even heavier. Whether you make your blanket off of store-bought denim or cast-off jeans, it’s pretty easy to make the blanket heavy enough for most users. So why not always use denim? Some users want a softer blanket. Denim can get expensive if you are buying it rather than upcycling old clothing. Most importantly, denim takes a long time to dry, so it may not be ideal if you are looking for a quick-dry blanket. Small glass beads are a popular weighted blanket filling with people looking for a non-plastic based filling. The glass beads wash pretty well, but can get hot in the dryer. They are also more likely to wear through fabric than soft pellets. They are not much cheaper (if at all cheaper) than poly pellets. Glass marbles are another possibility, but they should be used with care as they can be large enough to be individually heavy. Aquarium gravel is a very popular alternative to poly pellets in homemade weighted blankets. It’s a little harder on the fabric than poly pellets. It also gets hot in the dryer. But it’s a relatively inexpensive option. Gravel is somewhat heavy, so it may be harder to distribute the weight evenly throughout the blanket. It is more lightly to grow moldy over time than pellets or glass beads. Bouncing balls won’t necessarily hold up nicely in the wash (I certainly wouldn’t stick them in a dryer), but they are a creative filling that lends both weight and texture to the blanket. If you take this approach, I recommend sticking to only one or two balls per blanket section. Small metal washers are relatively inexpensive as a weighted blanket filling, but they can be hard to distribute evenly. They are relatively inexpensive for the weight, but also harder on fabric than poly pellets. They will get hot in the dryer. Many metal washers will stick to magnets. Depending how you look at it, this can be a good or bad thing, but it’s definitely something to be aware of! Stay away from metal washers that are large enough to do harm individually. Rice is inexpensive and non-toxic. Unfortunately, it cannot go through the washing machine and this is the reason I don’t personally recommend it as a weighted blanket filling unless you are sure the blanket will not need washing. If you really need a budget filling, consider sewing a blanket with velcro or zipped pockets. Fill each pocket with zip-locked (or double zip-locked) bags of rice until you have a heavy enough blanket. Cherry pits are organic, heavy, and can go through the washing machine. I’ve stopped recommending cherry pits as a natural filling, because they contain cyanide. You have to eat them for them to be dangerous, but children may do that, and possibly even some adults. Do you have a recommendation on how to make weighted blankets without pellets that I’ve missed? I am always looking to learn about new options and techniques! Please share on my Facebook page, or tag me on Instagram. 2. Most type of stones or sand shouldn’t be used because with a few exceptions most of them are porous . (including river rocks) and can become s home to molds. 3. Simply because some people worry about plastic pellets being man-made is NOT a legitimate reason not to use them. 4. Metal washers (like steel ball bearings) are a bad idea … imagine two siblings in a pillow fight .. one swings his metal filled weighted blanket and next thing you know, you have a trip to the ER. All good points. 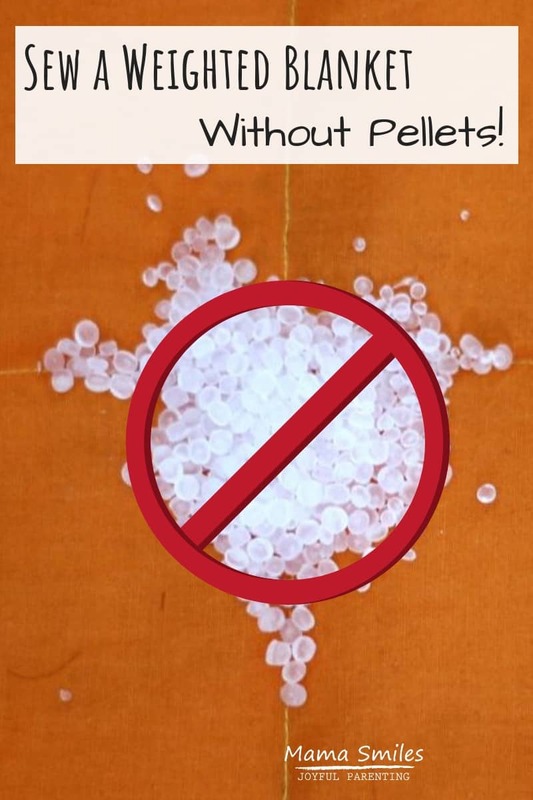 There’s a reason poly pellets are the most commonly used filler. That reminds me, I had an upcycled denim blanket when I was in college, and you’re right it was heavy. I might have to try that for a weighted blanket on my side of the bed…. It takes a pretty strong sewing machine to make one, but denim makes wonderful weighted blankets! If you used rice… would it work to just use a duvet type outer cover that could be removed for washing purposes? That would help! Rice blankets will eventually attract mold, though, simply because they are organic material and bodies let off a certain amount of moisture. You could routinely run it through the dryer on high heat to help prevent this happening. Why would pea gravel or smooth rocks get moldy? I think it’s unlikely to happen, but it was brought to my attention as a potential issue. I think it’s most likely to happen if they were left to sit for a long time or if you live in an exceptionally damp climate. I grew up with a large terry cloth throw that we used for picnics and at the beach. So as an adult, I wanted to make my own version. I used two large “bath sheets”, and then made a pillow case from matching hand towels. It’s got a great weight to it, and I can just fold it in half at the seam for a weighted blanket for one! Sounds like a fantastic, simple solution!